Beira, March 20: India's three naval ships have reached Port Beira of Mozambique, which has been ravaged by Cyclone Idai, and have delivered the first batch of Humanitarian Assistance and Disaster Relief (HADR) stores including food, medicines and clothing to the Maputo's defence authorities. India has become the first international responder to the Cyclone Idai in Mozambique, in which at least 1.5 million people have been affected by torrential rains and winds that reached the speed of up to 200 kilometres. "The ships of First Training Squadron of Indian Navy (Sujata, Sarathi and Shardul) operating in the Southern Indian Ocean were diverted to Port Beira, Mozambique based on request received from the Government of Mozambique to provide Humanitarian Assistance and Disaster Relief (HADR) to the local population post the devastation caused by Cyclone Idai which struck the coast of Mozambique on 15 March, 2019," stated the statement released by Government of India. 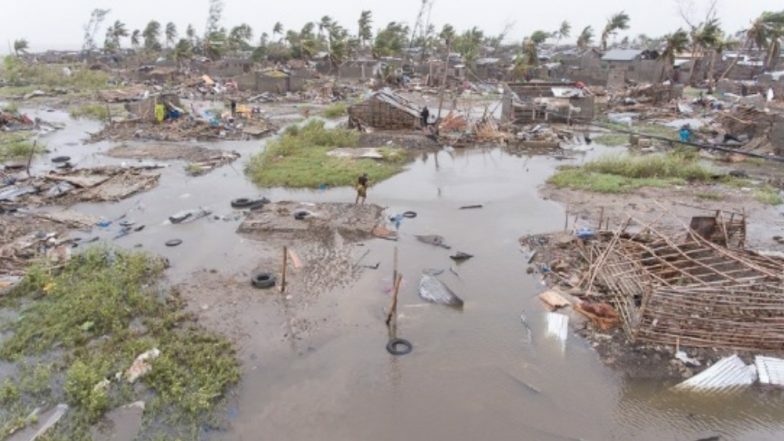 Cyclone Idai Disaster Death Toll Likely to Go Above 1,000 in Mozambique, 90% of Beira City Destroyed: President Filipe Nyusi. "The disembarkation of HADR stores including food, medicines and clothing to the Mozambique Defence authorities has been completed. Arrangements are in progress to disembark potable water," read the statement. Meanwhile, Mozambique's Defence Minister Atanasio M'tumuke has also visited the Indian Navy ships to "oversee the relief efforts". Indian Navy is also planning to set up medical camps and provide food, water, blankets and other necessary relief items, as required by the local authorities. "The helicopter from Indian Navy Ship Shardul is operating from the local airport for Reccee and SAR. The situation is being monitored closely and the Indian Navy is prepared to render all necessary assistance to the local population in Mozambique." the statement further read. Cyclone Idai made landfall at Beira in early hours of March 15 "causing widespread damage and loss of human life in the Central and Northern provinces of the country". Worsening the situation, bad weather and heavy destruction are hampering the relief and rescue efforts of military and humanitarian agencies in eastern Zimbabwe, which was hit by Cyclone Idai last week. Bulldozers and debri cleaners are struggling to clear up muddied roads in parts of the Chipinge and Chimanimani districts. A massive landslide had blocked the only road to Chimanimani. Helicopters have been deployed to carry out the rescue operation in a school which got buried under a mudslide.In Zimbabwe and Malawi, authorities said that 239 people (89 in Zimbabwe and 150 in Malawi) have been killed due to the cyclone.